View Loddon River (South) Basin in a larger map (opens new window). 58 ha. 2,900 ML. Toilet block, car park, no camping facilities. The reservoir is located in farmland and surrounded by river red gums. It is up to 14 m deep with a silt/sand substrate and extensive shallow margins with abundant weed growth. Barkers Creek flows into the lake where there are abundant snags. Swimming and boating is prohibited and bank fishing only is allowed. Contains redfin to 1.5 kg (av.400 g), brown trout to 2.2 kg (av.500 g), goldfish, tench to 2.5 kg and flathead gudgeon. Fishing with bait is usually productive and redfin fishing is best in the summer. Barkers Creek downstream of the Reservoir serves as an important fishery for junior anglers. It was planned to lower the water level in the reservoir during 2002 for maintenance. This was postponed for a year due to the already existing low water level and anticipated dry summer, and high water demand. After the maintenance work was completed, the use of the lake was to be reviewed. Possibly to be developed as a multi-purpose public area with the water level permanently lowered to reduce loss by evaporation. Barkers Creek Reservoir received significant inflows following the abundant rain in 2010. As a result the reservoir was stocked with 4,000 rainbow trout in November 2010, in addition to 1,000 rainbow trout that were stocked in June 2010. A small creek flowing through bush and farmland, gravel and mud bed. Becomes a series of deep holes near Laanecoorie Reservoir. Contains European carp, small redfin, goldfish and tench. Reported to also carry some blackfish, a few brown trout and occasional Murray cod. Stocked with golden perch in 1991 but stocking not continued. Last stocked with trout in 1962. Flows mainly through farmland, rock, boulders, gravel and mud bed. Has low flow during summer. Riparian vegetation had been mostly willow upstream of Clunes, which had choked various parts of the stream. Since 2002 there has been considerable work, by DSE, to improve the blackfish population in certain reaches of the creek. This includes extensive removal of willows, replanting of native vegetation, fencing along the banks to exclude stock and placement of snags in the channel to improve blackfish habitat, by the North Central Catchment Management Authority. Extra spawning sites for blackfish (plastic tubes) have been placed in the creek by DSE. Blackfish populations have been surveyed before and after the aquatic habitat rehabilitation works. Downstream of Clunes there is access at the Newstead-Clunes Road. Here the river flows in a steep valley through moderately sloping terrain. It is 6 m wide with an average depth of 80 cm and pools and gutters to 100 cm deep. It has good fish habitat in the runs and pools and abundant instream fish cover. However riparian vegetation of canegrass, blackberry and willows can restrict access to the banks. Contains a self-supporting brown trout population in areas of suitable habitat with trout to 1.2 kg (av.300 g), also redfin to 600 g, goldfish, tench, Australian smelt, mountain galaxias and abundant small blackfish to 300 g in the Smeaton area. Trout stocking has been tried but contributed nothing to the existing natural population. The domestic water supply for Daylesford and Hepburn, surrounded by forest. Bank fishing only is permitted. Stocked annually with brown trout and rainbow trout. 1,900 ha. 148,000 ML. Boat ramps, caravan park, camping facilities. A large, deep, storage supplying irrigation water to the Loddon River system and the western half of the Goulburn-Murray irrigation district. It is surrounded by farmland and although most of the reservoir is deep, there are extensive shallows at the southern end with abundant aquatic weed at times. There are large fluctuations in water level and the shoreline is devoid of trees. There are four main access points, two on the western side of the lake and accessible from the Baringhup Road (turn off the Pyrenees Highway at Middle Creek); and two on the eastern side (Woolshed Bay near the wall and accessible from Baringhup township, and Welshmans Reef near the south-east corner of the reservoir). There is a caravan and camping area at Welshmans Reef and basic facilities at the other three. Contains abundant redfin to 2 kg (av.900 g), brown trout, av.1 kg, (max. 5 kg), golden perch usually 1-2 kg but up to 9 kg, tench to 2 kg occasional Murray cod and goldfish to 1 kg. In recent years, redfin fishing has been good. Best catches are made in the late spring/early summer in deep water. Yabbies are the main food eaten by redfin in this lake and should be tried as bait on a running sinker. Jigging for redfin, particularly in the deeper water, is also becoming very popular. Fishing for golden perch with lures or bait improves during October to November as fish become more active. A small number of Murray cod appear to be present and are occasionally taken by anglers. This water has a mix of species and all species will seldom be available to anglers at any one time. Best fishing results come from targeting a particular species, understanding its habitat and water requirements, and learning the best way to catch that fish. Cairn Curran Reservoir filled rapidly following the abundant rain in 2010. 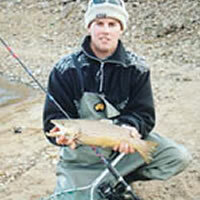 As a result the reservoir was stocked with 2,500 brown trout and 7,500 brown trout in November 2010. Family Fishing Lake. Toilets. Picnic facilities. Paddle pool. Adjacent caravan park. Consists of two small lakes accessible from Cushing Avenue. The main lake is surrounded by bush with lawn on the southern side. There is a good walking track around the lakes. Managed as a Family Fishing Lake and subject to stocking of one lake with advanced yearling rainbow trout (see Introduction). The smallest lake will be stocked with golden perch once every three years, starting in 2010. A domestic water storage managed by the Central Highlands Water Authority. Boating and wading are prohibited and a written permit, available from the water authority, is required for fishing. There are few shallows and the banks are bare and eroded as a result of the fluctuating water level. Contains brown trout to 700 g, tench to 600 g and redfin to 1.1 kg. Not a particularly productive water but it is regularly fished. Good fly-fishing from the shoreline in the western end of the reservoir. Stocked annually with brown trout and rainbow trout. Headwater of the Birch-Tullaroop Creek system. The catchment is highly modified farmland and has been mined for gold. Riparian vegetation is gorse, cumbungi and grass, with a small area of forest just downstream of Cosgrove Reservoir at Creswick. Substrate is gravel and rubble and some clay. A very shallow creek with some small pools 60-110 cm deep. There is seldom any flow in the upper reaches during summer. The lower reaches near Clunes contain redfin to 350 g, good numbers of small brown trout, tench, numerous small blackfish, mountain galaxias and Australian smelt. Last stocked with trout in 1958. 35 ha. 1,520 ML. Toilet and jetty. Controlled by the City of Greater Bendigo. A domestic water storage surrounded by box ironbark forest and located on the outskirts of Bendigo. There has been no public access in the past. However, it has been de-commissioned, transferred to the City of Greater Bendigo and developed into a recreational complex open to the public. Stocked in 2002 to 2005 with golden perch in an attempt to establish a population of fish. Stockings may recommence in 2009 as access and water quality problems have now been resolved. Set in parkland in Daylesford, this ornamental lake has jetties and boating is permitted. It contains redfin to 800 g and tench. Stocking with trout proved unsuccessful and it was discontinued after 1997. A deep lake surrounded by farmland. This is a domestic water supply managed by Central Highlands Water Authority. A written permit from the water authority is required for fishing access. Boating and wading are prohibited. Water is sometimes turbid from soil disturbance associated with farming in the red volcanic soils of the catchment. It contains brown trout and rainbow trout to 2 kg, redfin and tench to 600 g. It is fairly popular with Ballarat anglers. Stocked regularly with brown trout and rainbow trout. A domestic water supply 3 km southeast of Evansford and surrounded by forest and farmland. Bank fishing only permitted. Not stocked but contains some brown trout. A de-commissioned water storage surrounded by forest. Carries numerous redfin to 250 g. possibly golden perch and Murray cod. Stocked until 2005 with golden perch and a small number of Murray cod. Stocking ceased in 2006 because of a request from a client group to stock brown trout. Approval for this is still pending so DPI decided in 2007 to resume stocking of golden perch and Murray cod. until trout stocking approved. Stocked with both species in 2008. Revised future stocking of golden perch for the 1st and 2nd year followed by Murray cod in the 3rd year. Sequence to then be repeated. In 2010 a breakthrough was achieved by aquaculture scientists from the department at Snobs Creek when they successfully bred large numbers of Macquarie perch in captivity for the first time. This breakthrough will greatly assist the recovery of Macquarie perch in its natural range, given declines in its distribution and abundance. In 2009, Fisheries Victoria released 3,550 fingerlings into Expedition Pass Reservoir and Hollands Creek, near Tatong. In 2010, a further 3,000 Macquarie perch were released into Expedition Pass Reservoir. The Macquarie perch is a valued recreational fish in Victoria that can only be taken from a few waters in accordance with strict catch limits and an annual three-month closed season (refer to the Victorian Recreational Fishing Guide). Macquarie perch cannot be kept if caught from this waterway and must be returned to the water immediately. Family Fishing Lake. Seats. No other facilities. Located in a housing subdivision with private residences backing onto the lake. Walking track around the lake and some seats. Managed as a Family Fishing Lake and subject to stocking with advanced yearling rainbow trout (see Introduction). This is a new water, and scheduled to be stocked in 2009. 1 ha. Family Fishing Lake. No facilities. A deep dam located in a bush setting. Shoreline of grass and trees. Managed as a Family Fishing Lake and subject to stocking with advanced rainbow trout (see Introduction). 10 ha. Picnicking and boating. Bordered by forest and located east of the Ballarat/Maryborough Road on the southern fringe of the town. It is a popular recreational area. Contains golden perch, freshwater catfish, redfin to 1 kg, possibly brown trout to 1.4 kg, goldfish, European carp and tench to 1.3 kg. Regularly stocked with golden perch. Freshwater catfish are protected. Also known as Andersons Lagoon. This is a shallow domestic water storage and boating and wading are prohibited. Access is across private land and only by walking. There is an access track from the Smeaton/Blampied Road (Clunes Road), and a lane off the Daylesford/Newlyn Road. Being fertile and shallow, there is prolific weed growth, which can make fishing difficult. This is very popular fishing water, producing brown trout to 2.8 kg, (av.1.6 kg), rainbow trout to 2.3 kg, (av.1.6 kg), redfin to 860 g, (av.550 g), tench and goldfish. It reputedly fishes best in wet cold weather and there is good fly-fishing from the northern and southeast shoreline. Stocked regularly with brown trout and rainbow trout. Stocking suspended in recent years due to very low water levels. This is one of ten waters in which the relative efficiency of stocking fingerlings and yearlings and return to the angler from each size group is being evaluated. A similar trial had been conducted in this water in the early 1980s. Large numbers of fingerlings were stocked in place of yearlings. Three stiles over fences and signage to assist angler access have been provided as part of the Recreational Fishing Grant Program funded by Fishing Licence fees. Hepburn Lagoon filled rapidly following the abundant rain in 2010. As a result the reservoir was stocked with 10,000 rainbow trout in November 2010. An additional 10,000 rainbow trout were stocked by the Australian Trout Foundation with the permission of Fisheries Victoria. A very small water located on the outskirts of the town. Access requires a written permit from the Central Highlands Water Authority. Contains small redfin, tench, and goldfish. Last stocked with brown and rainbow trout in 2006. Flows through flat farmland and enters the Loddon River upstream of Cairn Curran Reservoir. Substrate is rubble and gravel downstream and gravel upstream. Width in the upper reaches at Garsed Road varies from 2-8 m. The riffles are 10 cm deep with pools 70-100 cm. It has extensive runs 40-60 cm deep, which together with clear water, no sedimentation, good bank cover, instream snags, a coarse substrate, fast flow and good pools, provide excellent habitat for trout. Bank height is 2-3 m and there is dense riparian vegetation of introduced plants such as gorse and blackberry, as well as some red gums, which can restrict access to the water. Access is through private property and much of the bank is fenced-off from stock, please ask permission to cross to the creek. There is public access at the bridge on the Guildford Road and better access upstream, via Garsed Road where there is a small natural reserve with no facilities. The public can walk along the river from the Garsed Reserve but dogs are not welcome because of stock. It is considered the best trout streams in the Basin. Brown trout from Cairn Curran Reservoir run upstream during May to spawn in the gravel beds. Contains abundant small brown trout with some to 1.4 kg, some rainbow trout to 700 g, redfin to 350 g also tench, mountain galaxias and eastern gambusia. Stocking with brown trout is not required. 4 ha. 370 ML. Family Fishing Lake and Premier Lake. Non-powered boating permitted. A deep artificial lake, 2.5 km from the centre of Daylesford. Surrounded by forest with abundant birdlife including resident peacocks. The lake is a popular spot for fishing. The Jubilee Lake reserve offers barbecue facilities, children's playground, a large playing field, a walking track which leads around the lake and a natural mineral pump. The Jubilee Lake caravan park is situated close by, with kiosk, accommodation options, paddle boat and canoe hire. The lake is managed as a Family Fishing Lake and subject to stocking with advanced yearling rainbow trout also contains larger rainbow trout, small redfin, roach and tench. Two all abilities access fishing platforms provide excellent opportunities for catching rainbow trout or redfin. Other limited bank access is available. Note: The access road to the reserve is locked each night as part of the caravan park security. 6.5 ha. Family Fishing Lake and Premier Lake. Non-powered boating permitted. The reservoir is located 3 km southeast of central Bendigo at the southern end of Strathdale Park. There is excellent road and pedestrian access from Reservoir Road and Crook Street. Facilities include a 1.36 km sealed walking and cycling track, which encircles the reservoir and electric barbeques, picnic tables and toilets. The reservoir is surrounded by reserves of indigenous vegetation. Most of the shoreline is accessible to anglers with the deeper water found along the northern bank. In 2008 two spacious and fully accessible fishing platforms were constructed and offer excellent fishing opportunities. Fishing is not permitted in a conservation area, at the southern end of the lake where a hide has been constructed for bird-watching enthusiasts. The lake is managed as a Family Fishing Lake and subject to stocking with advanced yearling rainbow trout but also contains redfin to 700 g and tench to 1.4 kg. Fishing methods include baits fished on the bottom with as little sinker weight as possible and small lures for redfin and trout. Also provides good fly fishing. Kennington Reservoir may be subject to occasional closures due to poor water quality. For current conditions or general enquiries check with the City of Greater Bendigo on 5434 6000. 488 ha. 8,000 ML. Boat ramp & caravan park. An irrigation storage on the Loddon River, surrounded by crops, grazing land and scrub. There is abundant standing dead timber and the bottom is quartz rock and gravel overlain by mud. The southern end is shallow with abundant aquatic weed. There is an 8 km/hr speed limit at this end but high speed boating is permitted at the more open northern end. This is a long, narrow reservoir and access is very good. Drought affected and water level is low (2008). Contains mostly tench to 1.5 kg, abundant redfin to 950 g, European carp to 4.5 kg, goldfish to 1.3 kg, golden perch and very occasionally brown trout and rainbow trout. Stocked regularly with golden perch and occasionally (2006) with brown trout. Provides variable, seasonal fishing. A small creek that flows into Newlyn Reservoir. Contains Australian smelt, redfin, tench, mountain galaxias, a very few brown trout and blackfish. This section of the Loddon River includes from its headwaters to the Serpentine Weir at Serpentine. The lower reaches down to the Murray River are described in Basin 7 north. The Loddon River rises 10 km north east of Daylesford and flows for 90 km (road distance) north to the Serpentine Weir. It has low turbidity and salinity and excellent habitat for native and introduced fish. It is regularly stocked with native fish and has several areas with a reputation for excellent fishing. Stocking of native fish by DSE and DPI during the last 12 years has significantly improved fishing downstream of Laanecoorie Reservoir. Seven reaches of river have been declared Environmental Water Reserves under the River Health Program and now receive an extra 4,000 ML/year, with a further 2,000 ML/year committed as an environmental flow allocation to supplement existing flows. In addition, various environmental flows, including a freshening flow, have been committed under the Bulk Entitlement Process, for five reaches downstream of Cairn Curran Reservoir to Kerang Weir. During the current drought up until 2008, these flows have not been provided. The catchment management authority is also undertaking significant habitat restoration work in the Loddon River upstream of Cairn Curran Reservoir north of Guildford and also downstream of Cairn Curran Reservoir as part of the River Health Program. Communities have also been encouraged to participate in local rehabilitation programs. Various reaches of the river near Eddington have been re-snagged with timber to provide fish habitat, as part of the Murray-Darling Basin Native Fish Strategy. There has also been a survey of fish populations carried out by Fisheries Victoria. Instream habitat for aquatic biota is generally quite good. There has been a reversal of the normal flow regime of the Loddon River with low flows in winter/spring and high flows summer/autumn. Observations of the river by DSE during the low flow periods, revealed good conditions still present in the pools, and adequate habitat to ensure survival of fish. The river has a good number of instream snags. The presence of numerous barriers to fish movement and spawning runs, in the Loddon River means that 'migratory' fish such as golden perch will have to be maintained by regular stocking. Temperature of water released from the reservoirs may also be too low to ensure spawning of golden perch and Murray cod, which require minimum water temperatures of 23o C and 20o C respectively, during their spawning season. Rises in steep forest and then flows through hilly farmland downstream of Vaughan. Rock, boulder and gravel substrate. It has a low flow in summer and often turbid water. It is a small stream at Guildford (3-9 m wide) with shallow riffles (30 cm deep) but there are some good runs and pools 60-100 cm deep. It has steep banks 2-4 m high, with riparian vegetation of wattles, tea tree and red gums and some instream cumbungi. Some good habitat in the pools. Good access at Guildford where there is a small reserve with no facilities, on the edge of the town. Access is restricted between Guildford and Newstead as the river flows through private property, some distance from the road. Contains a self-sustaining population of brown trout, with additional trout from Cairn Curran Reservoir also moving upstream in May to spawn. Contains abundant brown trout (av.400 g) with larger-sized fish to 1.7 kg downstream of Glenluce, and smaller brown trout and some rainbow trout upstream. Also carries small tench, goldfish and redfin to 330 g.
Flow in this 18 km reach of river fluctuates depending on releases from Cairn Curran Reservoir. The river immediately downstream of Cairn Curran Reservoir is up to 28 m wide with extensive pools up to 230 cm deep and long, shallow riffles (8-30 cm deep) at low flows. Substrate is rubble and gravel. Instream habitat and rubble provide good fish habitat. Further downstream the river flows through flat farmland with extensive stands of red gums along the banks. At low flow, river width varies from 3 to 15 m, with pools 50-60 m in length and up to 160 cm in depth, separated by short lengths of riffles 10-20 cm deep. Substrate is coarse gravel with abundant instream snags. There is good habitat in the pools. This section has never been surveyed by the Department but is reported to contain mostly redfin to 1 kg, a few European carp, goldfish, tench and some brown trout to 800 g.
This 27 km stretch of river has deep pools, excellent instream habitat and provides excellent fishing for native fish and redfin. The river flows through flat farmland with scattered river red gums along its banks. Width varies from 9 to 60 m. In places it has high (4-6 m) steep banks. It is very accessible at a number of locations with particularly good water at major road crossings at Newbridge, 10 km downstream from Laanecoorie Reservoir and Bridgewater. The section of river immediately downstream of Laanecoorie Reservoir has extensive areas of very shallow water (30-60 cm) and exposed sandbanks during the non-irrigation period (15 May-15 August). The small areas of pools (100 cm deep) are separated by shallow water which would restrict the passage of large fish. Substrate is sand and there is abundant habitat. This together with gutters and small pools provides good habitat for only small-sized fish. One of the largest areas of deep water is upstream of Newbridge where small boats can be launched from the bank. Here the river is 27-60 m wide. During summer, irrigation releases (which commence 16 August) ensure high flows resulting in riffles 30-70 cm deep and pools to 380 cm deep. Substrate in the pools is sand and mud with some gravel in the riffles. There are abundant snags in the bottom of the pools. During the non-irrigation period, water level falls by about 100 cm. Murray cod to 70 cm, golden perch, redfin and European carp can be caught in this locality. Further downstream at the Reserve (4 km downstream from Newbridge) the river becomes narrower and shallower in places with widths of 9-12 m and pools to 80 cm. Riffles with gravel substrate are 20-48 cm deep with scattered snags and log jams. There are patches of cumbungi along the banks. The water is too shallow for Murray cod but suitable for other species. The next popular fishing area is at Bridgewater (upstream from the Bridgewater Weir). Small boats can be launched from the bank, larger ones from the boat ramp. There is an extensive area of water 2 m deep. Riffles and runs vary from 50-70 cm deep with gravel substrate and good numbers of snags. There are patches of cumbungi, rocks, deeper water and habitat, which provide good instream habitat. This is a very popular fishing spot, which produces good numbers of Murray cod, golden perch to 2.7 kg and redfin to just over 1 kg. Baits and lures are successful with best fishing for golden perch in spring and summer. Other fish species in this section of the river downstream from Laanecoorie are tench, European carp, goldfish, Australian smelt, and eastern gambusia. Blackfish, silver perch and freshwater catfish are reported to have been present pre 1981, but their current status is unknown. Stocked at Newbridge with golden perch and at Bridgewater with golden perch and Murray cod. A fishing platform has been constructed at Bridgewater as part of the Recreational Fishing Grant Program funded by Recreational Fishing Licence fees. The river flows for another 23 km to a low concrete weir at Serpentine. This section has little public access and anglers need to ask permission to cross through private farmland. The river is deeply entrenched with steep banks up to 8 m high. There is a very light strip of mature red gums along the banks. Channel width is 24-30 m and substrate is predominantly sand. Pool depth at lower flow levels is around 150-220 cm, which increases to 250-320 cm during irrigation releases. Riffles are 40-50 cm deep. At some locations there is a considerable number of snags in the channel. Stocked with golden perch at the Serpentine Weir. No fisheries surveys have been carried out in this section of the river but it is likely to contain the same species as upstream. Anglers report variable fishing results with some golden perch and Murray cod taken. The best fishing location is at Serpentine Weir. The remainder of this river is described in Loddon River (North) Basin. 6 ha. Excellent picnic, BBQ, play equipment facilities. The lake is located in the residential area in Eaglehawk township. It is surrounded by an open recreation area and has good access all around the lake. Stocked by Fisheries Victoria in the past with poor results. Contains a few redfin and occasionally fished by locals. A deep lake surrounded by cleared farmland with few trees. This is a domestic water supply and bank fishing only is permitted. There are large fluctuations in water level and there is little aquatic vegetation. Accessible from Newlyn Road in the north, or Sutton Park Road in the south. Walking is required to reach the rest of the lake. Contains brown trout (av.1.2 kg), max. 2.4 kg, redfin to 1.5 kg, tench, goldfish and roach. Due to its accessibility, this is a popular water providing good fishing at times and is suitable for a wide range of fishing methods. Popular for fly-fishing in the northeast corner and in the south. Newlyn Reservoir filled rapidly following the abundant rain in 2010. As a result the reservoir was stocked with 5,000 rainbow trout in November 2010. Not shown on the map but is located north of the town. Stocked unsuccessfully with trout in the 1970's and now contains only goldfish. 1 ha. Not on the map but located adjacent to the Calder Highway at Kangaroo Flat. Stocked for the first time in October 2002, with a small number of rainbow trout for a special 'junior fishing' event. Not stocked since. A small domestic water supply surrounded by forest. Access requires a written permit issued by the Central Highlands Water Authority. Bank fishing only is permitted and it contains tench. Earlier stocking with trout was unsuccessful. Also called Government Dam. A deep lake surrounded by forest. Carries rainbow trout and brown trout, redfin to 900 g and abundant tench to 1 kg. Stocked regularly with rainbow trout and brown trout. 43 ha. 2,470 ML. A domestic water supply closed to fishing. Contains redfin and tench. A domestic water supply surrounded by forest and farmland and managed by Central Highlands Water Authority. Bank fishing only is permitted and access requires a permit issued by the water authority. Not a particularly productive water, with bare banks, fluctuating water level and little aquatic vegetation. However it is still a popular water and contains redfin to 2 kg, brown trout to 1.6 kg and goldfish. It produces good fishing on occasions. Low water levels in 2008 but stocking will recommence when conditions allow. Family Fishing Lake 2.5 ha. A small lake just east of Neangar Lake on the edge of Eaglehawk township. Surrounded by grass and forest. No picnic facilities but all these are available at Neangar Lake. Managed as a Family Fishing Lake and subject to stocking with advanced yearling rainbow trout (see Introduction). Also called Deep Creek in the section below Tullaroop Reservoir. Upstream of the Tullaroop Reservoir, it flows through farmland, rock, rubble and gravel bed. Stream width varies from 3-5 m in the shallow riffles (10-20 cm deep) to 12 m in the pools. Excellent habitat with pools 100-150 cm deep and with good fish cover. High banks (4 m) at Clunes, with riparian vegetation of willows and poplars. Nearer Tullaroop Reservoir the creek flows in a steep valley with riparian vegetation consisting of red gums, canegrass and tea-tree. There is an extensive section of creek with grass banks and good access at the Mount Cameron-Cotswold Road crossing just upstream from Tullaroop Reservoir. Contains abundant blackfish, brown trout, Australian smelt, mountain galaxias and flathead gudgeon with tench and redfin nearer the Reservoir. No longer stocked with trout. The creek downstream of the Reservoir flows through farmland and has a mud substrate. Contains small redfin, goldfish, brown trout to 1.7 kg, Australian smelt. Also contains golden perch from regular stocking since 1990. Last stocked with golden perch in 2005 with further stocking planned. River improvement work under the River Health Program, is occurring in Tullaroop Creek. 742 ha. 74,000 ML. Picnic area at the spillway, but no other facilities. Limited access to the shoreline by vehicle. Tracks in poor condition. A deep domestic water supply surrounded by light forest and grazing land. The reservoir has extensive shallow edges and stands of dead trees. Boating and wading are prohibited but bank fishing is permitted. Accessible at the wall (Rodborough Road) but access to the shoreline is poor, being limited to only a few places and walking is generally necessary. It contains brown trout average 2.4 kg, maximum 2.7 kg, abundant redfin to 1.5 kg, tench to 2 kg, goldfish and occasional golden perch from an accidental stocking in 1994 in Tullaroop Creek upstream of the reservoir. (Intended stocking site was below the reservoir). There is an established 'wild population' of brown trout in the lake that are in good condition although not always easy to catch. 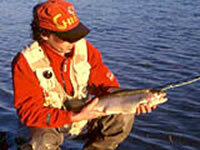 Trout fishing is often more successful in winter and spring and particularly early and late in the day. It was last stocked with trout by the government in 1978. In the late 1990/s the reservoir was unsuccessfully stocked with trout fingerlings by 'Trout Services Victoria', a private group. The Ballarat and District Anglers Association received funding from the Recreational Fishing Licence Trust Account in 2002 to stock rainbow trout. Anecdotal reports suggest these fish survived and grew, providing good results to shore based anglers. Tullaroop Reservoir filled rapidly following the abundant rain in 2010. As a result the reservoir was stocked with 5,000 brown and 5,000 rainbow trout in November 2010. An ornamental lake, set in a park in the northeast fringe of the town, and open to boats (including powerboats) and bank fishing. Contains redfin to 750 g, European carp, goldfish, tench to 1.6 kg and freshwater catfish. (Freshwater catfish are protected and must be returned to the water alive). Trout stocking in the past proved unsuccessful. 7 ha. Boating is prohibited. An ornamental lake set in parkland north of the town and just east of the Midland Highway. It has a mud bottom and a dense growth of aquatic vegetation. Contains only goldfish and redfin as trout stocking in the 1970's proved unsuccessful. 2 ha. 750 ML. Used to be called Wombat Creek Reservoir. A deep domestic water supply surrounded by forest. Boating and wading is prohibited and a permit from Central Highlands Water Authority is needed for fishing. Contains brown trout, rainbow trout and a few redfin. Stocked regularly with brown trout and rainbow trout. Anglers report trout being taken near the dam wall.